Complete the ratings in each diamond, including special hazards. 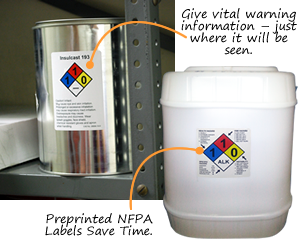 Some label templates allow you to add precautionary text or a fuller chemical description. • Avoid the headache of handwriting your labels. Preprint the chemical's name, ratings and, optionally, the CAS number. • Some markers are over-laminated for extra durability. • Wizard shows you how to choose your rating. Add the chemical's CAS number, synonyms and PPE code. • Preprinted labels are more legible than hand-written labels. To see over 250 Chemical NFPA Labels in stock click here!